Russell Brennan Keane and Bank of Ireland Business Banking came together last Wednesday to update senior executives in the Midlands business community on significant changes happening in the legal and banking landscape which will impact on all businesses. Catherine Sweeney and Fiona Murphy of Russell Brennan Keane provided updates on the impact of the New Companies Act 2014 and some topical tax incentives. Ms Sweeney welcomed the focus which the New Companies Act brings to private companies which represent 95 per cent of Irish companies and the legislation now more appropriately reflects this landscape. In commenting on the proposed new ‘Knowledge Box’, Ms Murphy acknowledged that a new approach was required in order to incentivise innovation in the Irish economy. Regional business manager for Bank of Ireland North West, Brian Carey, said, “We are delighted to be involved in presentations such as this with RBK which provide Bank of Ireland with the opportunity to share our own insights with the accountancy community on what we see happening. 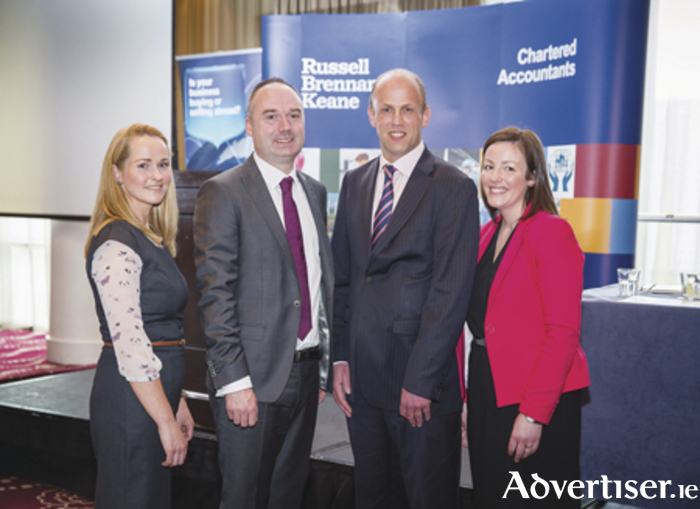 Speakers at the Russell Brennan Keane business event were L to R: Fiona Murphy, Taxation Director, Russell Brennan Keane; Cathal Melia, Audit Partner, Russell Brennan Keane; Michael Lauhoff, Head of Business Banking Growth, Bank of Ireland and Catherine Sweeney, Corporate Compliance Manager, Russell Brennan Keane. Are you ready for career coaching?